Avery turned 1 month old on April 14, 2014. Instead of celebrating that milestone in July at home like we had originally planned, Shawn, my husband, and I celebrated in the Cook Children’s Neonatal Intensive Care Unit (NICU). In an effort to celebrate the occasion with a “normal” parent activity, we bought those one month milestone stickers that you see parents sticking to their child’s onesies and posting pictures on Facebook and Instagram so we could do the same. The whole activity didn’t take long at all but for those 15 minutes of taping the sticker to her diaper and taking pictures, I felt like a “normal” parent. So much has happened in this first month. We’ve been through what the nurses and doctors call the “honeymoon phase” when things are going well and are relatively drama free. And then, the “roller coaster ride,” as everyone refers to it, began. There will be a few good days in a row that really get your spirits up and then you’ll come back the next day and, like a slap in the face, you are met with unsettling news and faced with setbacks. All that progress your child has made is erased and you feel like you’re starting over in some cases. In this first month, we’ve been through things that no new parent wants to experience. We’ve learned that Avery has a congenital heart defect called a patent ductus arterius (PDA) and she could possibly need surgery. We’ve witnessed her being “bagged” or resuscitated more times than I care to count. I’ve watched her get a catheter because they thought she might have a urinary tract infection. She’s had multiple blood transfusions. Poor baby has fought off pneumonia and continues to get help breathing with the support of a ventilator. In addition to those scary things, we’ve also hit some key milestones. She is now over 2 pounds! She has grown an inch and a half. She has been cleared of brain bleeds. She is tolerating her feeds and is producing dirty diapers regularly. Poop is something that is highly celebrated around here! I never knew I would be so excited to see my daughter poop, but it’s a great sign that her digestive system is working properly. It’s hard to actually feel like a parent in a situation like this when you have a team of doctors and nurses doing most of the work for your child. Right now, I cherish the simple things like taking her temperature and changing her diaper because those are actually things I can do for her by myself. I got to help give her a bath the other day and it was the most I’ve been able to touch her since she’s been born. It was the best day I’ve had in weeks. And even though we have very limited interaction with her right now, we are getting to know our daughter. Things we’ve learned so far: She is a feisty little thing. She doesn’t hesitate to push the nurses away when they are doing something she doesn’t like. She doesn’t like to sleep very much. She is not very good at being still. It often looks like she’s having her own little dance party in her incubator, especially when she lies on her tummy and shakes her little booty. The more I learn, the more I am intrigued by her and I can’t wait to learn more. You can read part one of Avery's Journey here. Kelly Wooley is a Marketing specialist at Cook Children’s. This is the second in a series of blogs chronicling the birth of her daughter Avery and their time spent in the Neonatal Intensive Care Unit. 13 years ago I was right where you are. Samuel was a 25wkr at Harris Downtown. Samuel had the PDA ligation and multiple other procedures. He spent 8 1/2 weeks on the vent and had BIH, as well as ROP lazer surgery. I remember those day like they were yesterday. Samuel is doing incredibly well now at 12 1/2. I will keep you and your family in my thoughts and prayers as you go through this journey with your extra small/extra large miracle. You, your husband and Avery will be in my daily prayers. I held my sister, her husband, and my nephew's hand during his stay at Cooks NICU. May she be blessed to live a long, healthy life. Kelly,Our church has a prayer blanket ministry, and they have made a blanket for Avery. Hopefully, Steve and I will be able to get it to you soon. We are keeping you, Shawn and Avery in our prayers. My son had a week stay at Cook's when he was 10 weeks old. He was fighting a virus that had him running fevers over 106 at times. The team of nurses were awesome. Babies are instinctively fighters, and it seems like you have a feisty baby girl. I will pray for her. May God bless you and your family! It's easy to see where Avery gets her fighting spirit. She is a very lucky little girl to have such loving parents. 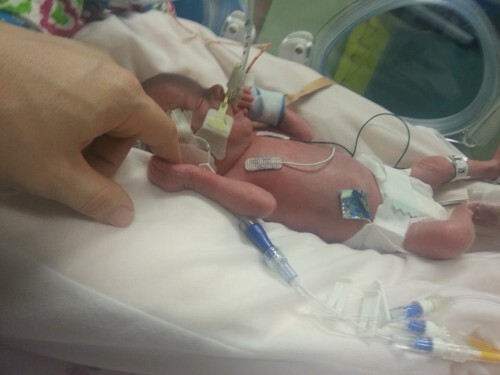 I was only 2lb when I arrived in the world and I am healthy and happy. I am married with two kids. Keep your faith! The medical world has come so far since I was born. Many thoughts and prayers for your family. Your doing great. Blessings to your family,my wife and I were there 12 years agoafter my son of 25 weeks was still born but the good Lord gave him back to us. We too experienced what you are going through, pda, chest tubes,life support good news bad newsetc.Family we want you to know we understand your situation but we learned to trust in God and believed that by his stripes we are healed. Now our son is 12, an A student and an aspiring musician. We will be there at cooks this weekend for checkup and possibly another surgery but we still believe in miracles.Family, pray and trust in the Lord for your miracle will be home with you sooner than you EXPECT!! GOD BLESS AND PRAYERS IN YOUR FAVOR!! We have been where you are twice! Our first born was "perfect". Our second had multiple issues and we spent his first 3 months in NICU in another state. We were not planning on having anymore for various reasons. God had other plans! :) Our third (and final!) was born with a congenital heart defect (among other issues)and had his first heart surgery at 3 days old. He has had 4 major surgeries and was reopened to be put on ECMO after flat lining. He is a wonderful little 4 yr old full of life and energy! He still has at least one other surgery to go through. Appreciate the good times and try not to get too down about the bad day! Remember to take care of yourselves and take breaks when you need them! It's ok to leave her in the care of the nurses so you can take care of you! Hang in there and know that you are not alone! The nurses and doctors at Cook's are the absolute best!!!!! You are in excellent hands!!!!! Prayers that she is home soon!!! Thank you all so much for the updates. Avery is always in our prayers. Avery's journey continues at Cook Children's NICU. She's turned 1 month and her "roller coast ride" continues.